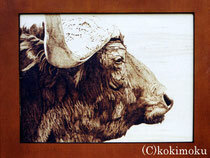 Welcome to the website of wildlife artist Haruki Koizumi. Haruki's career dates back to 1988, when he started wood burning (pyrography), the art of drawing on wood with burn marks with thermal pens and burners. His work has since expanded to include sculptures and pins of small animals as well as paintings (mainly oil and acrylic), many of which are displayed on this website. 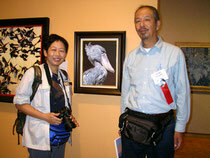 Haruki's source of inspiration is the great beauty of nature and wildlife. He hopes you will enjoy his work and share his fascination. Haruki Koizumi was born in 1951 in Ibaraki Prefecture, Japan. After graduating from college, he spent his 20s and early 30s working for a Japanese manufacturer and later farming. He started his career in art in 1988 after teaching himself the art of wood burning. In 1997, "Black Vulture" became his first work to be accepted into Birds in Art, a prestigious juried art exhibition of contemporary artistic representations of birds, organized by the Leigh Yawkey Woodson Art Museum in Wausau, Wisconsin. 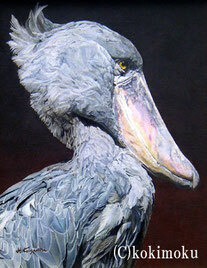 His works have been selected for Birds in Art seven times to date: 1997, 2001, 2004, 2005, 2007, 2008 and 2010. 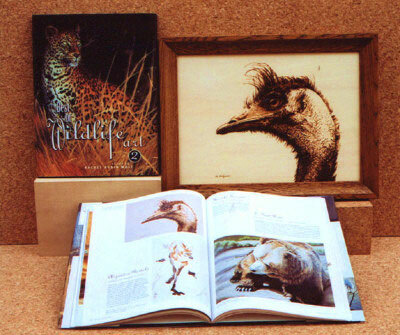 Haruki's work in "The Best of Wildlife Art 2"
Today he works on his paintings, sculptures and pins at his home and studio "Kobo Kokimoku" in Yokohama. Sculptures and pins are designed and roughly carved by Haruki, while his wife Junko does the finishing work. As a pioneer in wood burning in Japan, Haruki serves as the chairman of Japan Wood Burning Association. Wood burning is the basis of Haruki's creative work. Pictures are drawn or stippled on wood with burn marks, using thermal pens and burners. Varying the temperature of the heated tip and duration create different shades and tones, capturing the warm textures of natural wood. In many of Haruki's recent works, color is added with acrylic, oil, colored pencils, etc. In BPS (Burning, Painting and Sanding), the drawing is painted with gesso or acrylic paint after the basic design is burned in. It is then dried and polished with sandpaper. BPS is a new technique developed by Haruki, who was inspired by Japanese lacquerware, and it is still evolving through trial and error. Some of Haruki's BPS works are given a finishing touch with acrylic or oil paint. Haruki also does oil and acrylic painting in addition to the above methods. Wild birds, including eagles, hawks, ducks, etc. Wild animals, including wolves, big cats, horses, etc. Chipmunks, Japanese squirrels, flying squirrels, etc. Baby rabbits, rabbit families, etc. Cats, owls, rabbits, flying squirrels, etc. 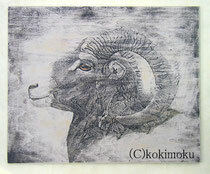 ・Haruki and Junko Koizumi's works are currently available in Japan only. ・All other pages on this website are written in Japanese. Copyright(C)2016 kokimoku. All rights reserved.